The knit fabric of a cover resists pilling and fraying. It lasts quite a while. However, like other fabrics, a cover can eventually develop pilling. The result is that a cover can start to feel less comfortable. Pilling also occurs with other items of clothing. Washing and drying gently can help. 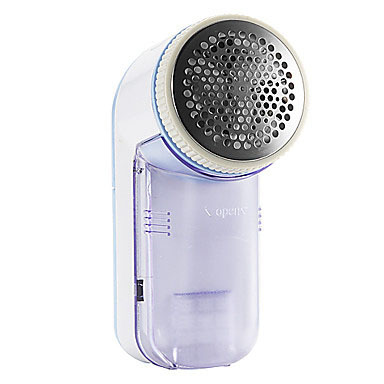 We use a battery powered pill remover similar to the picture to basically shave off the pilling. It works on our clothes; it works on my Comfort Cover. If you notice that a cover is starting to feel a little too large for your mask, it might be that the knit fabric has stretched out a bit. Launder the cover in hot water and dry in the clothes dryer. This will help the fabric to tighten up. Another trick for having a cover last longer after it appears to be getting tired is to turn it inside out. This gives you an entirely new fabric surface. If you use the SoClean or other such devices to sanitize your CPAP equipment, it is better to remove the covers and launder to remove any oils or dirt.